Training in the use of work equipment is required by most health and safety legislation and work at height regulations. Employers are obliged to train and instruct employees to a sufficient extent. 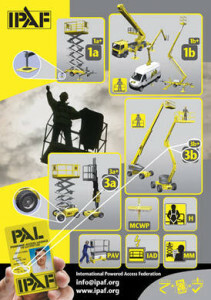 The IPAF training programme for platform operators was developed by leading industry professionals. It is certified by TÜV as conforming to the international standard ISO 18878:2004 which describes the training for mobile elevating work platforms – operator (driver) training. More than 90,000 operators are trained each year through a worldwide network of over 550 training centres. Successful trainees receive a PAL Card (Powered Access Licence), a safety guide, a log book and a certificate. Objective: Trains a demonstrator to familiarise operators with their responsibilities and demonstrate pre-operational and safe operating procedures, and the limitations of MEWPs. Objective: To instruct a user to be able to select, inspect and use a harness and associated equipment safely when using a MEWP. If you have questions, require individual advice or wish to make an appointment, please contact us at +49 3588 2546-18 or use our request form.